We bought our farm about fifteen years ago. Renee had her horses boarded and wanted to get a farm so she could keep them at home. I agreed as long as it was clear that I wasn't going to feed, water or clean up after them. 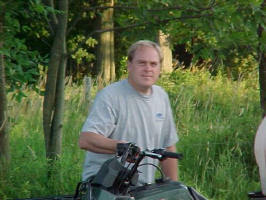 One day I was out mowing the pasture on our riding lawn mower when I slowed down for a hole. George, Renee's horse, ran into the back of me. He was following me the whole time and I didn't realize it. That is when he won my heart. One afternoon I went to an auction with a neighbor to sell one of his horses and ended up buying Rhoda our mule (she has since passed on). That was the start of my insanity!! The speech about how I was not going to do anything went right out the window. I really lucked out with Rhoda, she was a very patient teacher! She rode and drove, so we thought we would hook her up to our cart and go for a ride. After about an hour we finally figured out how to put the harness on her - by this time she knew she was dealing with beginners! Shortly after that a friend told me that he had a couple Lamas at his house that he was holding for the Humane Society. We went and looked at them and felt so sorry for them that they came home with us (we have since re homed them). Then I thought it would be nice to have a miniature donkey, that's when I got in really deep. So I started to search the Internet for information on them. 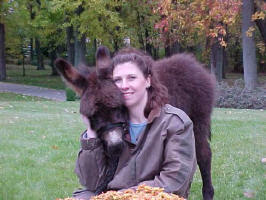 When I started to read about miniature donkeys I learned you shouldn't have just one, I needed two. We decided to go visit a few local breeders to see what they had, with the intentions of maybe purchasing two donkeys. At our first stop we left with three! After having them home for a short period of time we decided that we would buy a jack and have a foal or two, that was twenty seven donkeys ago!! Renee keeps telling me that I must have fallen and hit my head! Now she has fallen in love with them and I can't get her to let me sell any of them. She tells me each donkey is special and has to stay. But with twenty seven we both agreed that our pasture can not handle any more and we will have to sell a donkey from time to time.